I've been asked periodically to show a progressive series of images on how I work. 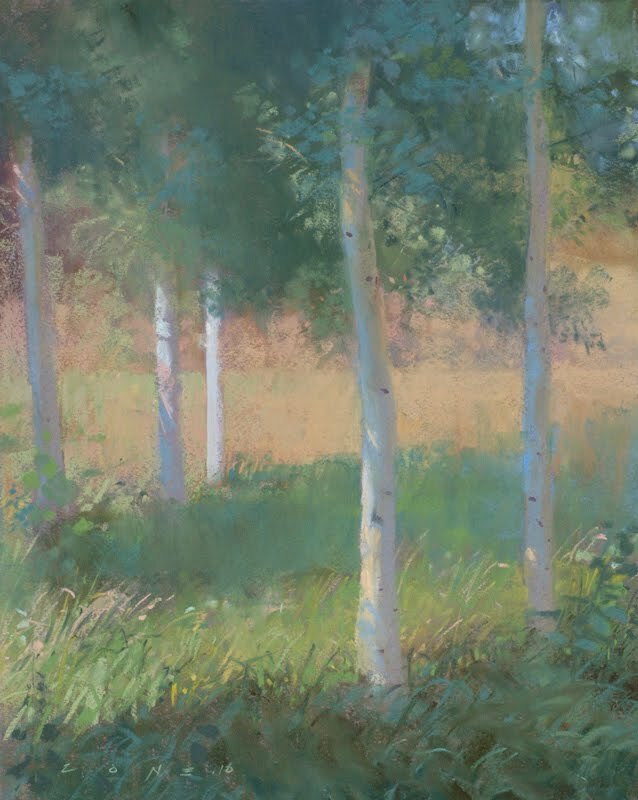 It is a lot more convenient to document one's work in the studio than it is outside, as the working pace is not constrained by the changing light. There are natural stopping points indoors... a phone call, a meal, a bathroom break, or just to step back and judge the progress, assess the overall balance, decide what's left to do, etc. I am doing some new work for a group show of Pixar artists at the Holton Studio in early December. As gallery owners and framers deserve to be kept in the loop when the clock is ticking down towards a show, I initially shot this to apprise Tim Holton of what was coming his way (and to assure him that I was actually working on something). Anyways, I took the opportunity to document the progress of this work, as much for my own curiosity as to to satisfy anyone else's interest. The images below were taken over a week's time, some the same afternoon or evening. This is from a pastel study I did on my last Sierra trip in August to the Little Lakes Valley on the East side of the Sierra. 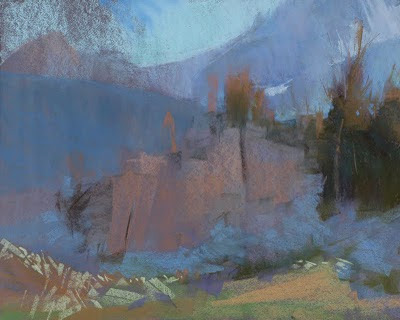 Some notes on my process are given below each image. I should mention that I enjoy studying the game of chess, and a great part of that pleasure stems from reading over the annotated games of players, where they record their strategic ideas, plans, hopes and fears throughout the process of a game. There is a similar process in the creation of a painting, in my mind. Here's the starting point. I'm working large (for me). This is a 17 x 21 sheet of Canson Twilight taped onto a piece of foam core. I have my field study and a reference photo off to the right. Working in the living room on a Saturday. I'm just laying in all the big shapes. A painting is a 2 dimensional pattern of value and color relationships, regardless of the subject, so my initial marks are just to cover all those areas with a basic foundation color and value. Basic proportions are judged relative to each other. Trying to avoid jumping into any one area, and just keep moving, but you can see I want to play around in the trees against the background on the right. There's some rich color and interesting edges up there. Clearly started on the right, and headed left. Keep in mind pattern relationships are not necessarily object based, they are simply the major visible differences in the image... masses of things, shadow shapes, etc. 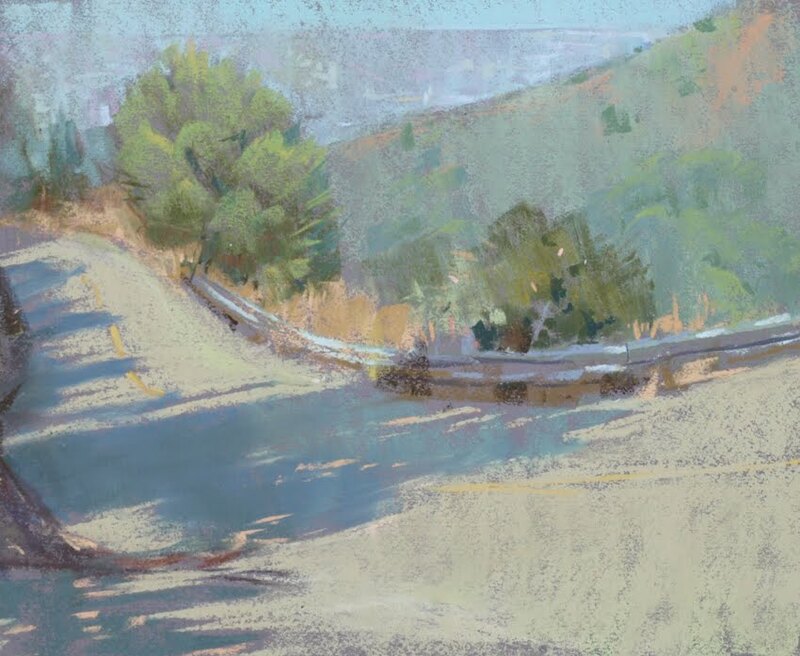 These shapes and relationships form the underlying structure and composition of the final image. Continuing the journey to the left side of the image, but starting to work back into already established zones with the color I'm aiming for, pushing values and temperatures around, and refining edges. This is where a field study is invaluable, as opposed to only having a photograph. One's own color impressions and perceptions are often significantly different than what a camera is necessarily capable of recording. 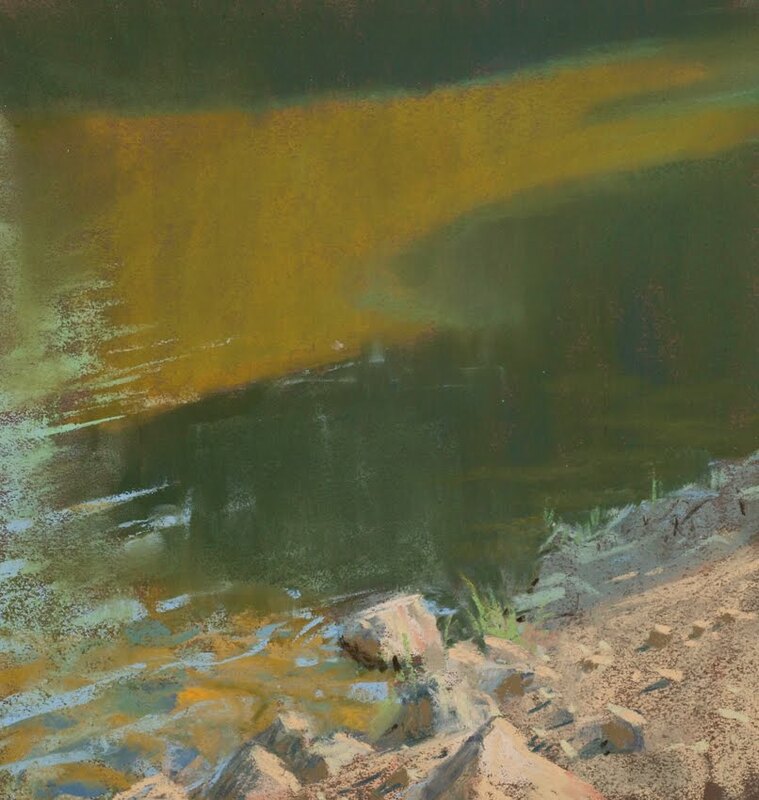 I usually reference my field study for the range of color, value, and my subjective impression of the experience, while the photo provides a more accurate reference for detail and placement of edges and forms. It was fun to knock in the boulders on the lower left like a bunch dinosaur teeth. 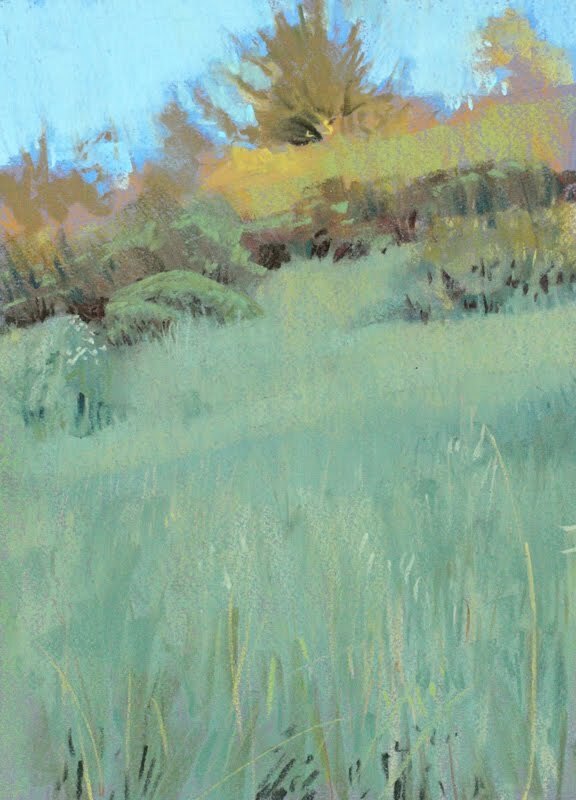 Most marks are kept pretty chunky, but I am starting to gradate color in the sky and the background peak that runs off to the right, as it moves towards the light. 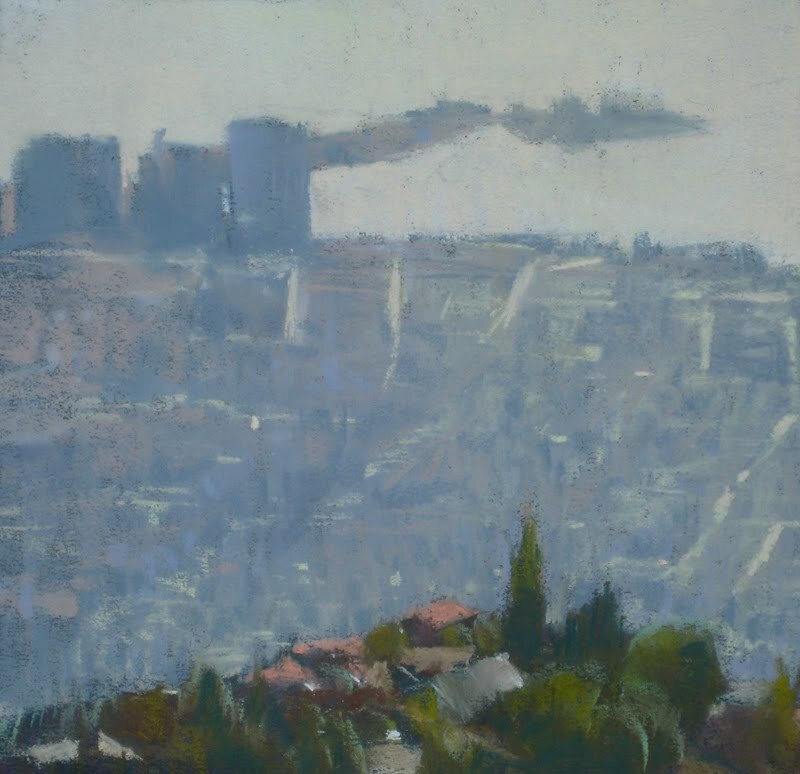 The upper left needs a cloud, and two layers of overlapping forms before I can justify more work in the foreground. 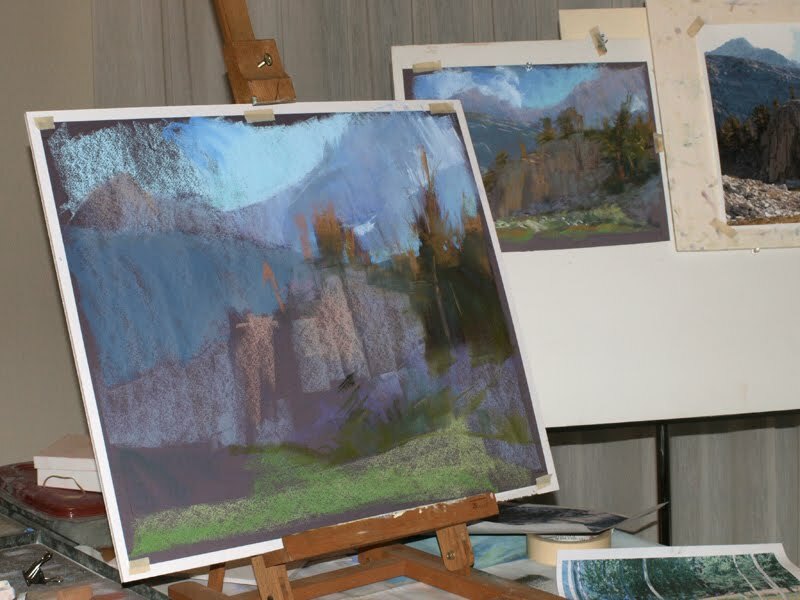 Overall, I've probably put 90 minutes into the work, broken up into a few sessions over one afternoon and evening. Sunday Session: It's raining out, I've got a Flemish pot roast burbling away in the other room, and the music is turned up. Olfactory and auditory sensations are good! Time to immerse. The upper left has been laid in...cloud, bg peak, and midground blue cliff all have some level of detail in the appropriate value and color range to keep it subordinate to the main contrasting zones of the image. I may make subtle adjustments and refinements to these areas, but they are pretty much done. Monday Evening: I've got a cold, and am sneezing and dripping. You can see some evidence of that condition right at the horizon of the sky and the curving ridge above center. I've added warm light to the cloud and pushed the atmospheric light temperature on the upper right side of the image, behind the trees, and in front of the snow patch. The entire tree line has been indicated across the top of the cliff. At this point I've got the whole image up and running, and am now looking to balance and refine certain areas. At a glance, it can almost feel done, and the challenge from this point on is not to overwork it, but find a way of gracefully exiting the process after further resolving certain areas. 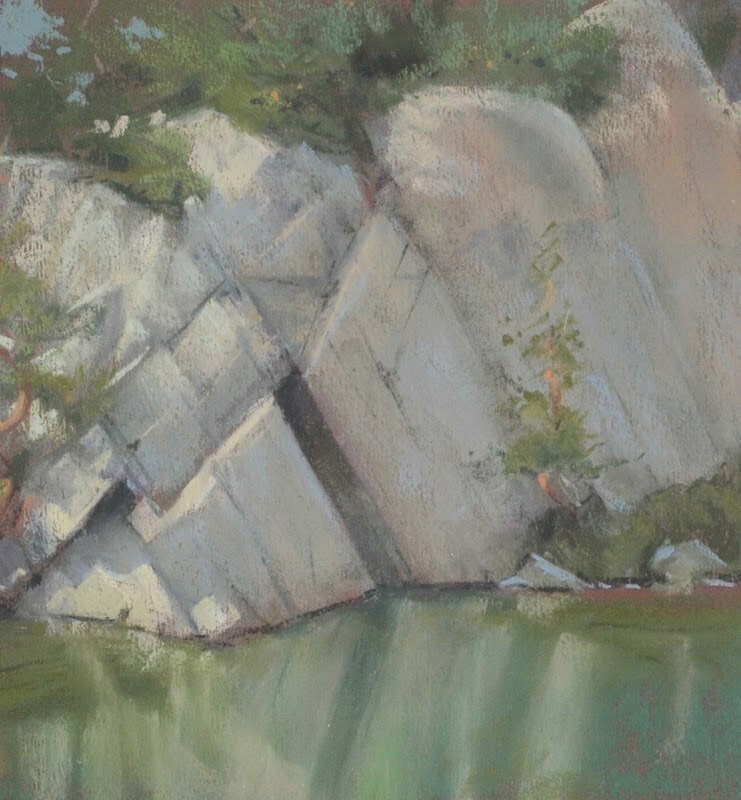 The cliff is full of creases, crevices, and a range of differing temperatures on its faceted surface. Danger! 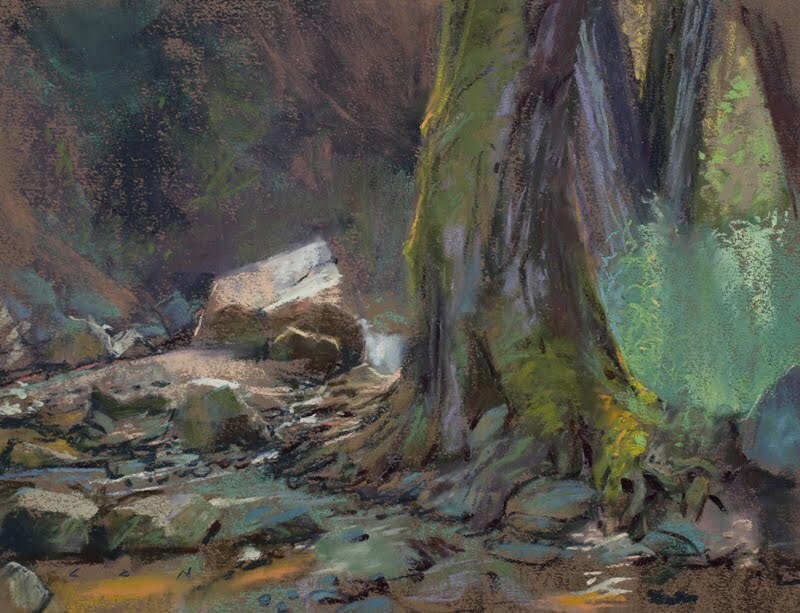 The boulder field on the left needs to progress further, the cool talus slope below the cliff in shadow can use some more definition, as can the trees on the upper right. 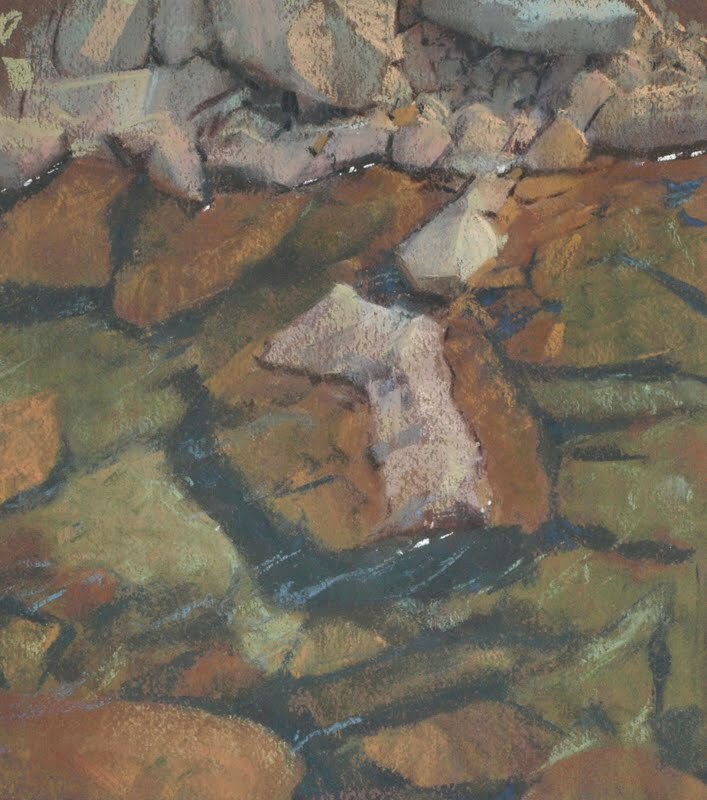 I again refer to my field study to see what I thought was important information when I was there, as the photo reference shows 'everything' in excruciating detail, and a far blander color scheme to boot. The lower right quadrant of the image has a level of loose handling, and luminous color relationships that I'm happy with, so I use that as a guide towards resolving the rest of the image. My real job kept me busy the rest of the week, so I wrapped this up the following Saturday morning, working the lower left boulder field, the more distant cliff slope behind it, and readjusting color temperatures and contrast on the central cliff. 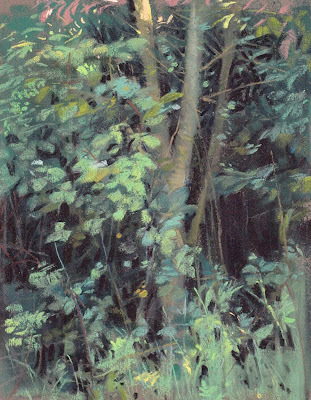 I think I missed a bit of the earlier more luminous trees up top, but I at least managed to quit at this point. Talk tonight at the Studio Gallery....Go Giants! I recall my first solo show at the gallery last year opened right around, if not on, the income tax filing deadline. We were a bit concerned over the prospect of having an exhibit in a month where folks may have just written 2 big checks to the government, but things worked out fine. May tonight have such a rosy outcome. For those that won't be attending my talk because they want to watch a penultimate game, (and you know who you are) all is forgiven! But If you happen to be in the corner bar watching the game, feel free to run down the street to the gallery during the commercials, for brief tidbits of art wisdom between innings. 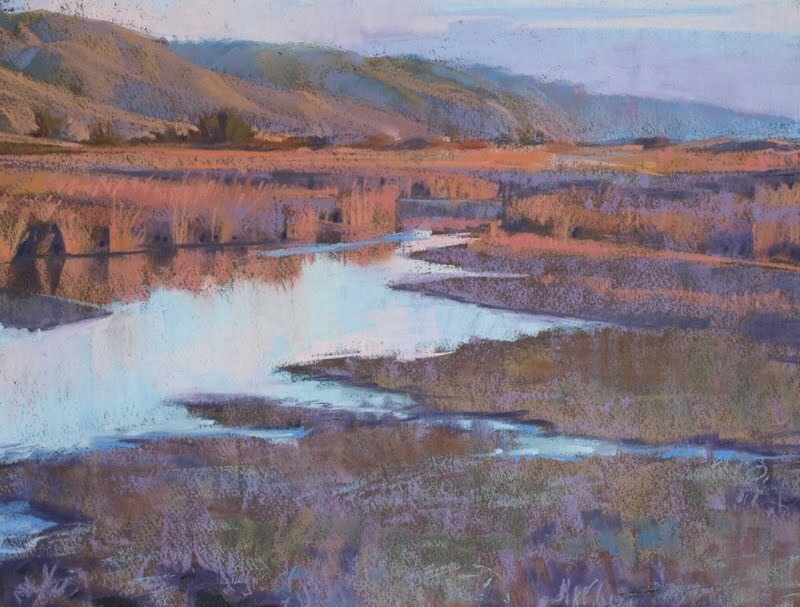 Hey, some of my best artist friends are major Giants fans.. A love of sports and art are not mutually exclusive, he opined, deftly sequeing into his closing remarks. For those that want to read a hilarious article on the potentially vast gulf between die hard sports fans and sensitive 'arty' types, I point you to George Plimpton's Marianne Moore in Yankee Stadium in his wonderful book George Plimpton on Sports. I have 2 shows coming up, and one of them is just around the corner. I'll be exhibiting at the Studio Gallery in San Francisco, from Oct. 13th-Nov. 7th. The reception will be this Saturday, the 16th, from 2- 6. 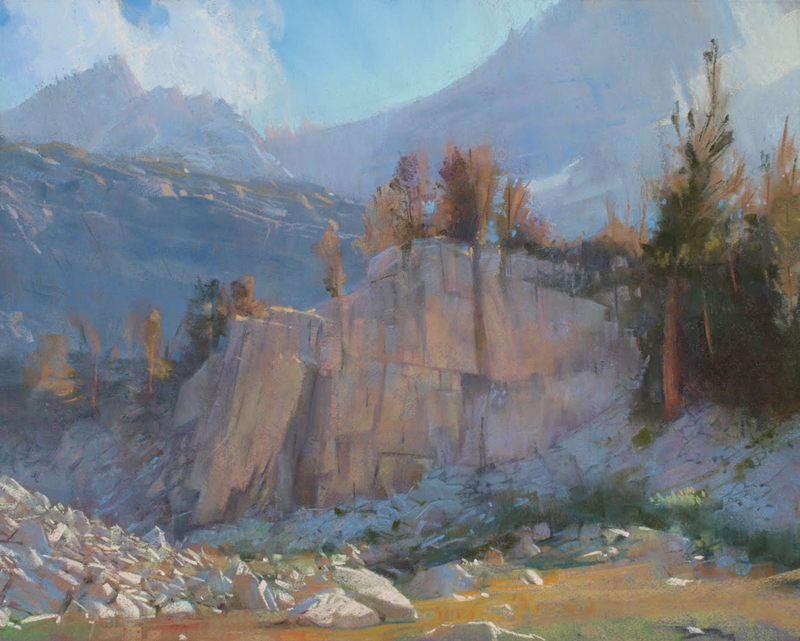 There are 41 paintings focussed in three areas, the Sierra, the Grand Canyon, and local views and foliage studies. I've done 4 studio pieces for this show, and the rest were all done on location. An online catalog of the entire show is available here. Selecting 'view slideshow' allows you to see all the images without having to click on each one. Meanwhile, here's a few of the pieces that are in the Studio Gallery show with notes. I spend a week in Oregon every year at a family reunion/vacation at Black Butte Ranch. 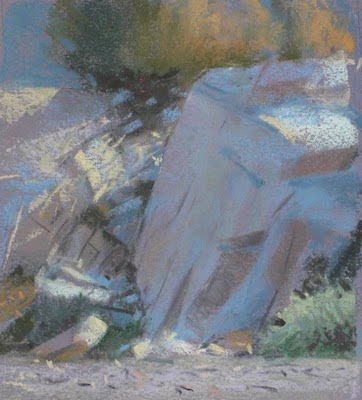 It is one of the places I first started using pastels outdoors in the mid-90's. 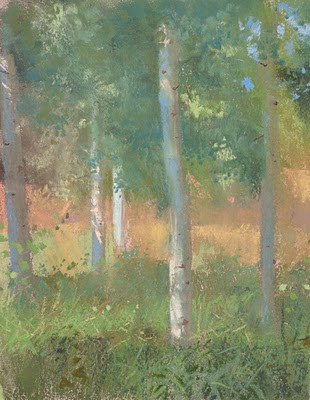 There is an enormous meadow in the middle of the property with a bicycle path running across it, bordered on the south side by small aspen groves. I have been whizzing by them on my bike for over 15 years, but this year I stopped, and spent 3 quiet afternoons working in this dappled space with flickering circular aspen leaves and pale trunks exhibiting beautiful colors. I'll probably be sitting here next summer as well. This is a studio piece from a packtrip to Pear Lake in Sequoia National Park in 2009. 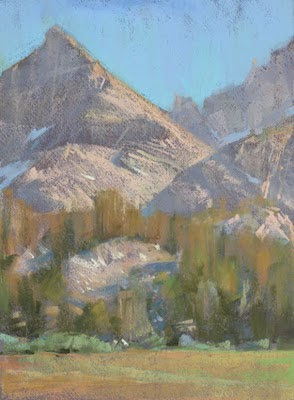 I had already stopped at one lake to paint, and walked off the trail to look at this one, but wanted to keep moving. This small lake had several great rock falls, cliffs and beautiful green depths of water. 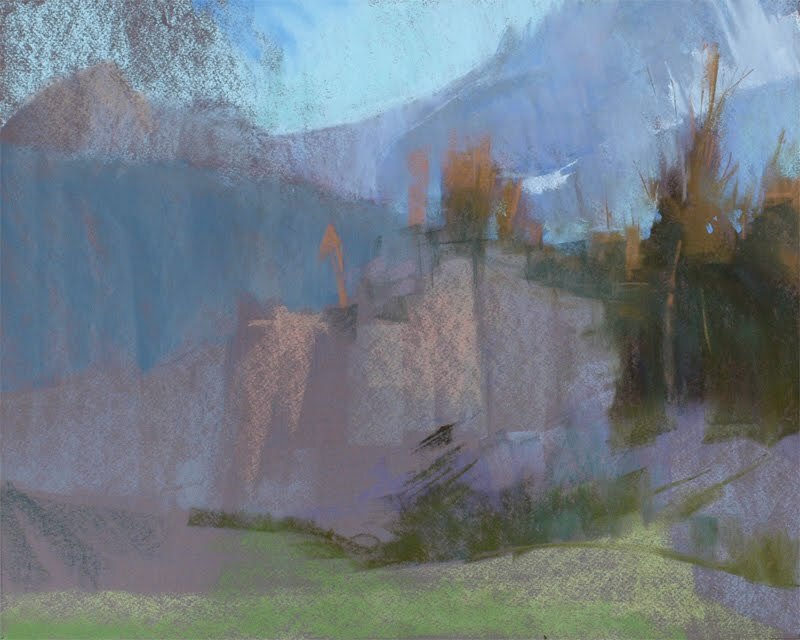 set of pastels, and did several studies while I was there. This one was a good candidate for a studio piece, due to the level of complexity in the smaller forms. You can see the field study for it in this post. 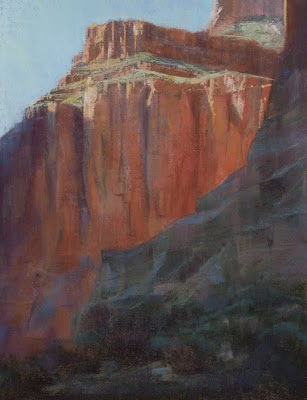 I have ten pieces in the show from a Grand Canyon trip I made in 2008. 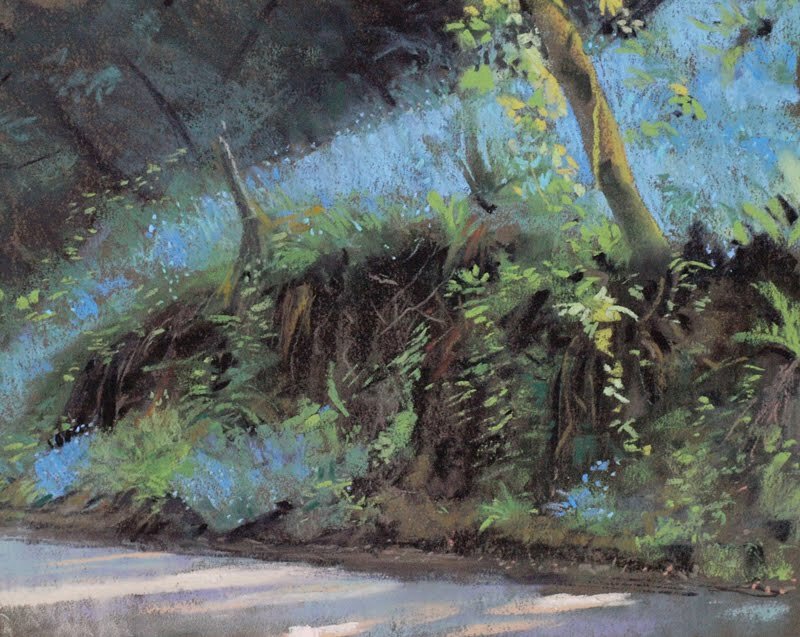 I hope to return there and paint some more. 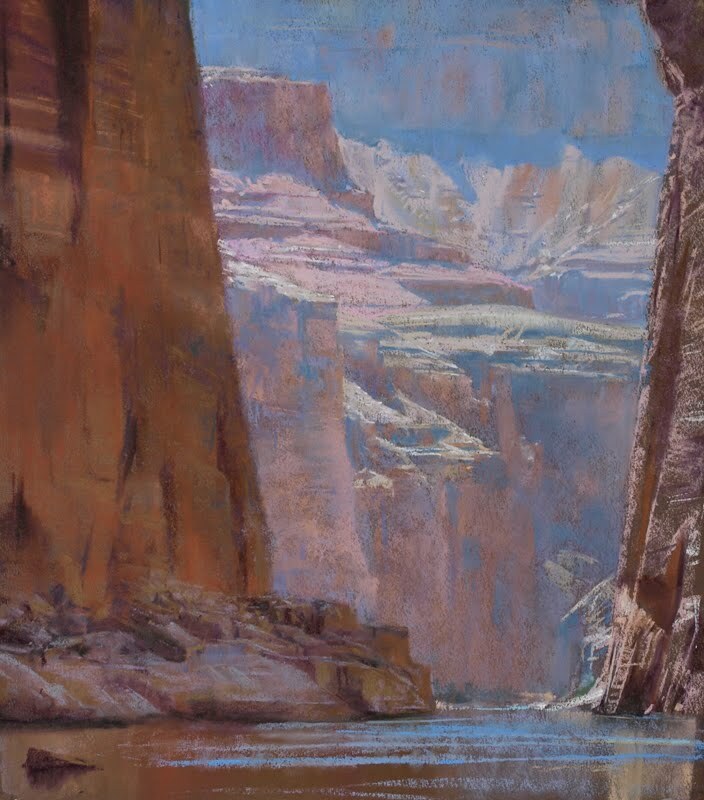 It really is an overwhelming experience for an artist to be immersed in a world of such complexity, scale, and the strength of reflected light and color into shadows. Combine that with 100+ degree heat, 48° river temperature, thundering rapids, and all your senses are fully loaded. 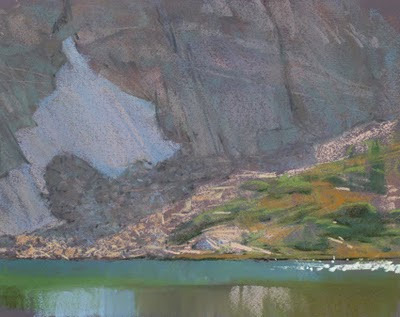 I could only paint when the rafts were pulled over, and we were on the water from about 8 am to 5, so we motored past an extraordinary number of views I desperately wished I could paint. This image is a typical example of me gawking at a massive display of reflected light into a shadow as it casually drifted by one morning never to be seen again. That's where the studio comes in. 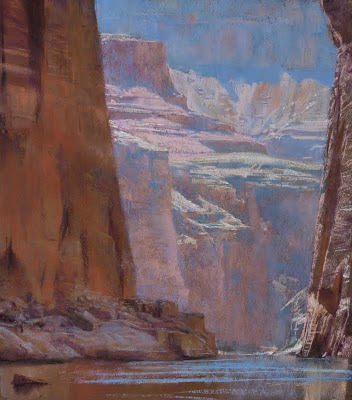 Even in the confines of the canyon, one could periodically see a fair distance, and when the light got low enough, quite a bit of atmosphere was visible. The river would make a turn, and suddenly you were looking down a long corridor towards the light with large shadowed portals on either side. You were always in motion on the water, so the scale was dynamic in nature, as a slow parallax effect told you how 'big' the world really was. I'll also be participating in a group show of Pixar artists that opens in early December at the Holton Studio in Emeryville. 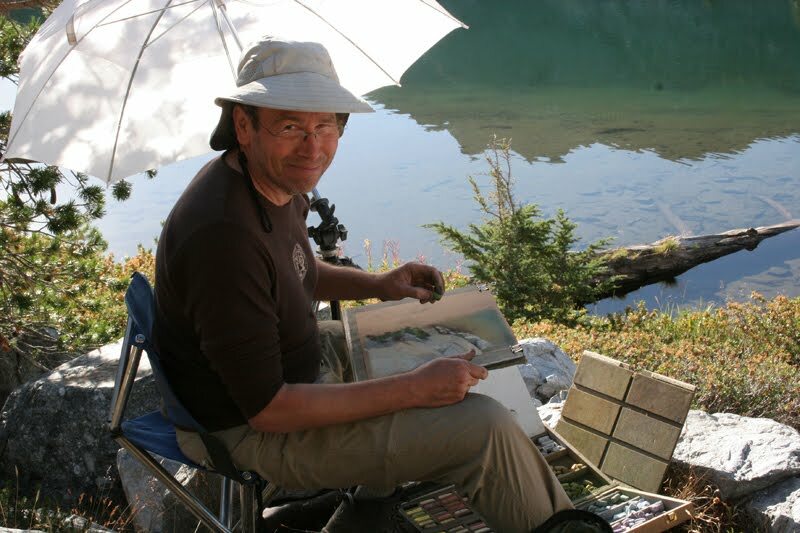 Tim Holton handcrafts beautiful hardwood frames, and also maintains a gallery space. The other artists are Ernesto Nemesio, Dice Tsutsumi, and Sharon Calahan. I am excited to see what everyone is doing, as we've all been busy at work on different projects, and I haven't been out painting with any of them in quite awhile. I'll post more details on this show when I finish the pieces, and the opening date is firmed up. I hope to see some of you at the reception this next Saturday, the 16th at the Studio Gallery. A group of painters and photographers spent a productive week up in the Little Lakes Valley at Chickenfoot Lake the last week of August. 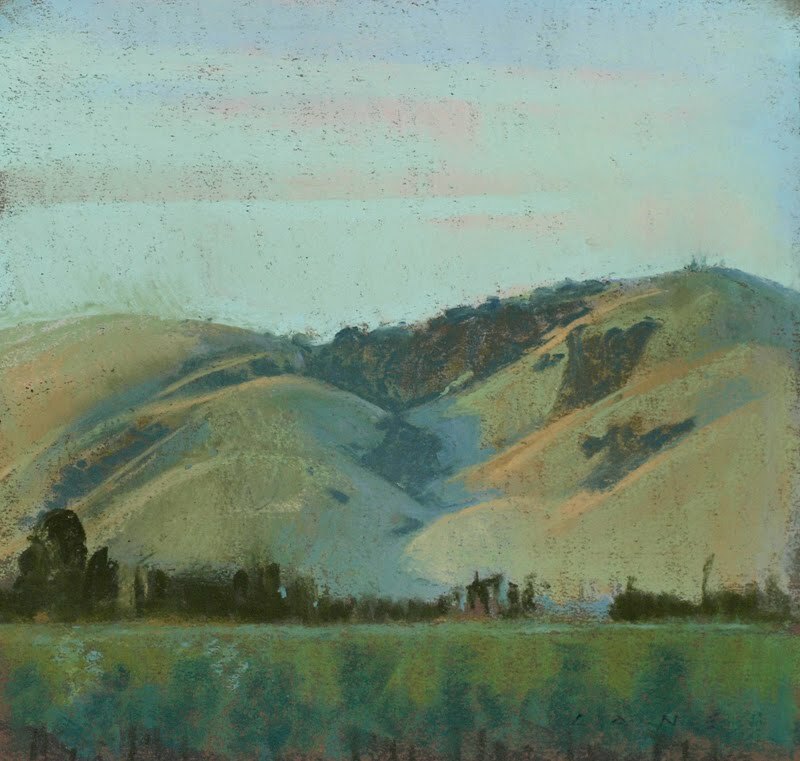 Paul Kratter, Terry Miura, Carolyn Hesse-Low, and Michele De Braganca were the painters, while Bob Watters and John Fernbacher comprised the photographers. This trip marks the 6th year a group of us has packed into a wilderness area to paint. Following our traditional modus operandi, we hired a pack station to take the bulk of our gear in on mules, as well as supply a cook (Kate, along with her trusty dog, Cody) for the trip. The goal was to focus on painting and not be responsible for the food, or running the camp. 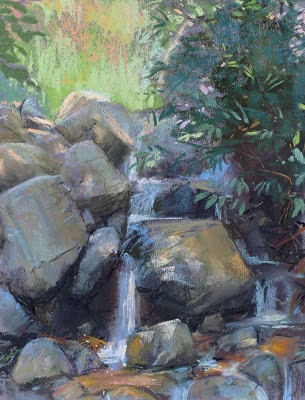 We were blessed with decent weather for the most part, though some high winds at night, and during the day, had a way of cutting short our sleep, and sapping the motivation to paint at times. Overall it was a great trip, with some wonderful scenery to work with, as well as a good group of fellow artists to commiserate with in the mornings and evenings over some tasty meals. Here are some images below with notes. This was the first piece I did on the afternoon after our hike in. 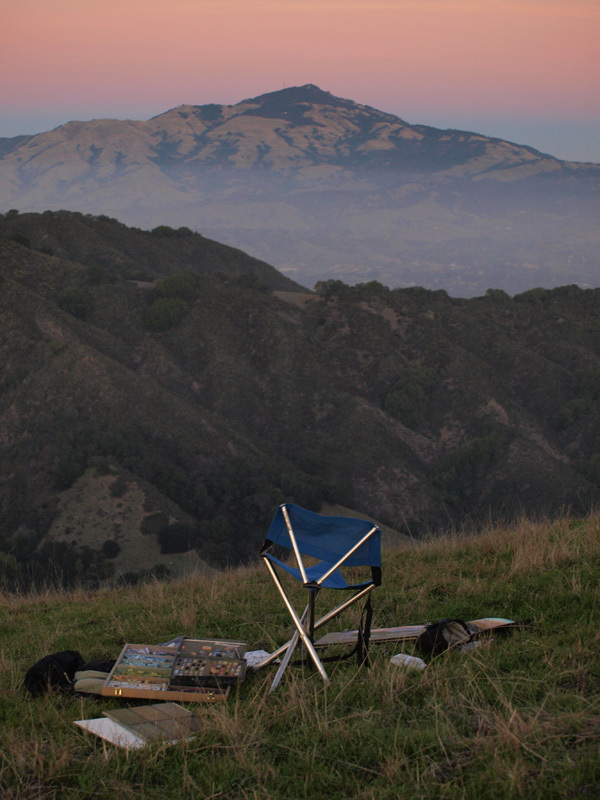 We were camped near a meadow, which is visible in the bottom of the image, surrounded by high peaks on 3 sides. This view shows a slice of the horizon looking towards the south, across the meadow where the inlet came in. I never sleep well the first night out on these trips. This one was no different. It is sometimes a relief to get out of the tent at dawn, and do something... drink coffee, complain about not sleeping, and get to work! This was a view looking towards Morgan Pass, where the morning sun was cutting through. 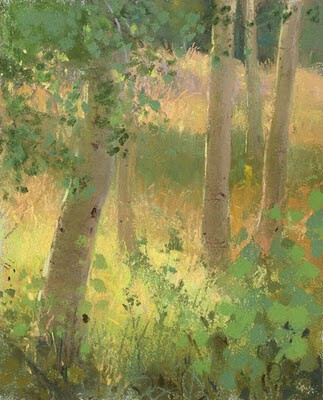 The eastward facing slopes of the valley reflected warm light into the shadows quite powerfully, adding a lot of subtle temperature variation. I had spotted this small cliff surrounded by talus across the lake the day before and thought it would make an interesting subject. The pale local color of the rock in shadow allowed for a range of warm and cool relationships from the warm bounce of the rocks in light, the color of the lake, and the cool sky illuminating different planes of the rocks. 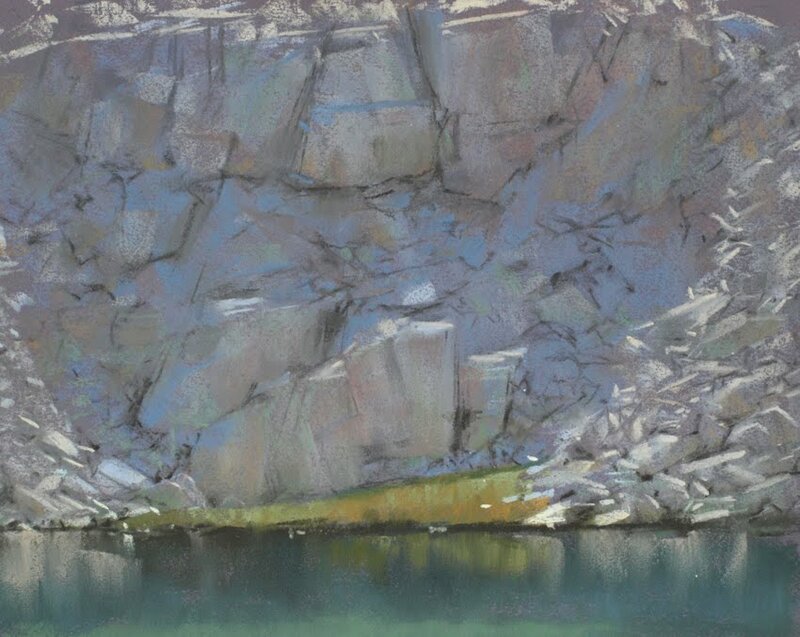 Gem Lake was tucked into a steep bowl surrounded on 2 sides by talus and cliffs. There were several large distinctive snow patches on the north facing cliff walls. This was painted in late afternoon on the second day of the trip. There was a low ridge of cracked and faceted granite across a dry inlet from our campsite. Behind this small ridgeline lay an arm of the lake, and beyond that an absolute wall of talus forming the West slope of Mt. Morgan. 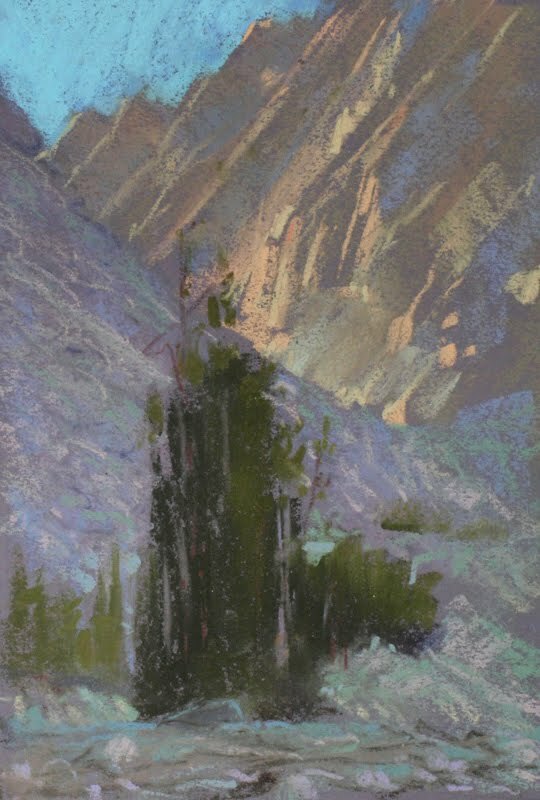 I am attracted to the colors of granite in shadow because it beautifully portrays the range of colors coming from secondary sources... in this case the sky, and the warm reflected light off the mountain walls catching the morning light across the valley. 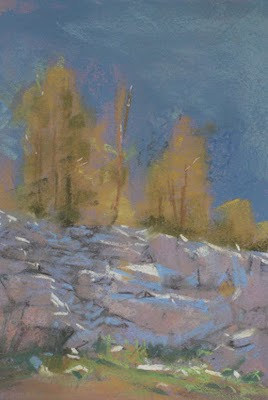 The backlit trees added to the range of color, and the background, shadowed, rocky slopes were the last part of the equation.... one I couldn't quite figure out! 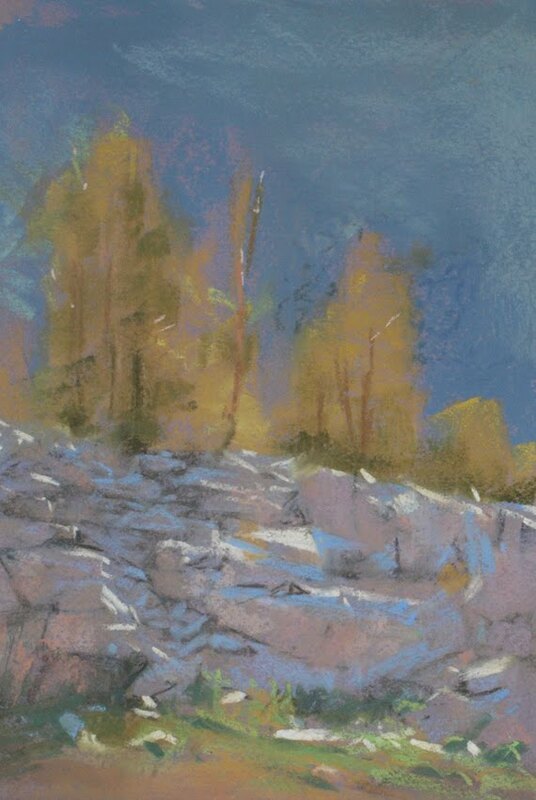 You can see me 'testing' different marks and values in there, trying to indicate some boulders in the distance. At a glance, I perceived a blue field of color, but a second look always revealed some detail back there. 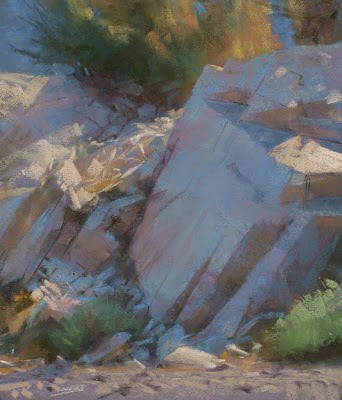 I did four studies of this area trying to decode rocks, trees, and that distant shadow. This one is a candidate for a studio piece. After struggling with backlighting and shadows, I hiked up to Gem Lake again and found Terry Miura finishing up a nice portrait of Mt. Morgan with some erratic boulders in the foreground. We were getting a lot of clouds blowing over, so the light was changing quite a bit. I found some shade to work in nearby and spotted this distinctive rock formation across the lake. While I waited for the light to move to one side and give a better light and shadow pattern, I painted a study of some trees huddled against a small cliff. No go on that one. Was this one worth the wait? 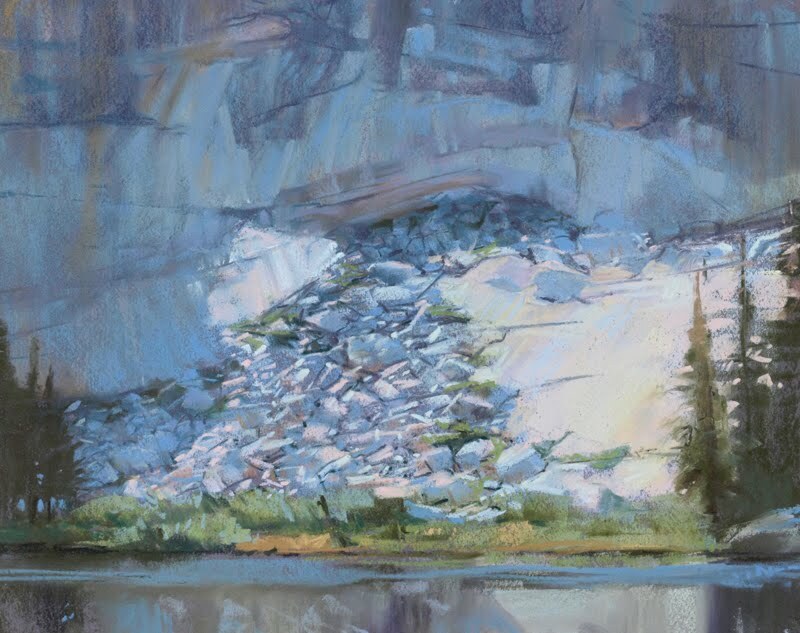 The light that day was rather pale, as the cloud cover tended to dull the blue character of the shadows, but I still was attracted to the graphic pattern of the rock. You pick, you commit, and you pay the consequences! There's always another day. This kind of subject matter has been intriguing me more and more this last year, so it was on my radar while I was wandering about up there. I am interested in using foliage patterns as graphic elements of an image, and am happy to combine that with other qualities of form and light that attract me, such as water and rocks. There were several small drainages that ran out of the upper lakes down through boulder choked meadows, with small willow shrubs lining the banks. 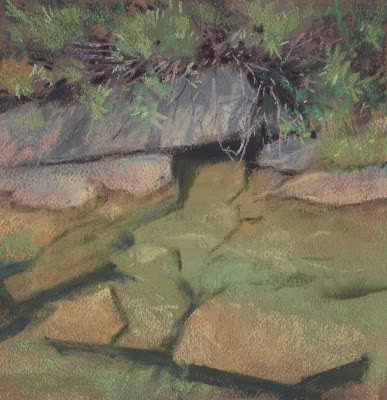 Even in these narrow creeks, brook trout could be seen racing about for cover as one approached. There was just enough depth in the water to see the range of color moving towards green. Another variable that may have helped me with this image was the weather. The clouds were building up all morning to the south, the light was coming and going, and it looked like rain was going to finally come. In fact, a few drops did come down at one point. Consequently, I worked much faster on this piece, and had no time to noodle, as I am prone to do at times. 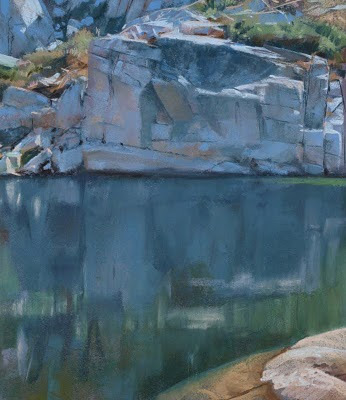 I always enjoy painting rocks and water, as I love the richness of color as a rock is immersed in water. I confess to noodling on this one, but I felt it needed that sort of attention to snap into focus. 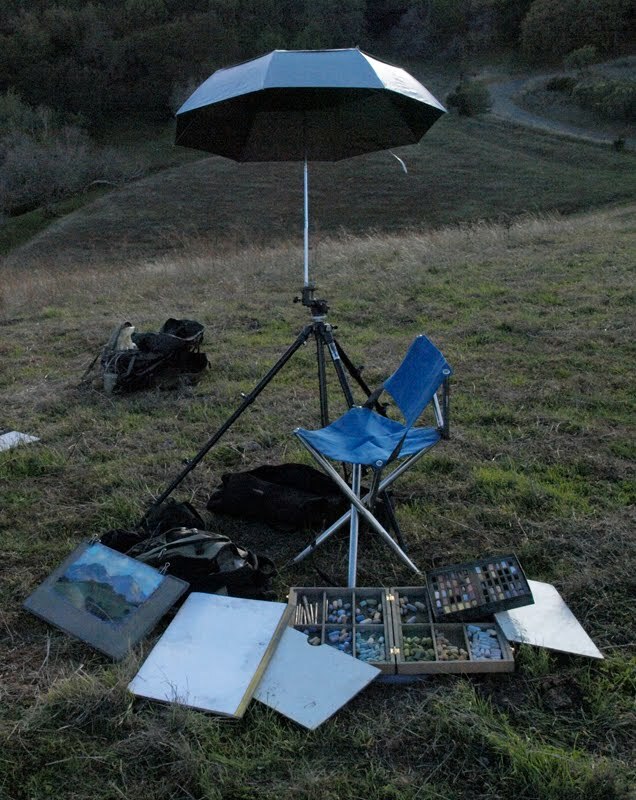 There was also periodic, strong gusts of wind hitting me, so at times I had to stop working, and just hold onto my easel and umbrella. This was my view to the south while I was painting the water and rock image. The end of the Little Lakes Valley just goes up and up. I was interested in the cliff area in the middle, as well as the tree leaning up into the distant peak silhouette on the right. I first intended to do two separate studies, but then realized they were all connected, so decided to paint a fairly wide angle of view, which I don't do very often. It was late afternoon, and the gusts of wind were a constant assault on one's gear and senses. 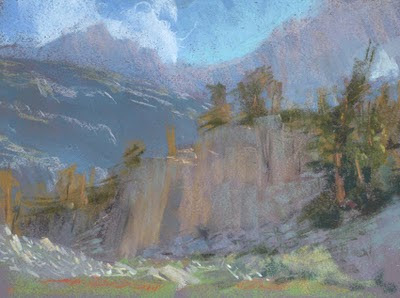 I was tired, and really wanted to get out of there and back to camp, so I worked as fast as I could, just indicating shapes and values. Its a fairly 'soft' image, but manages to get down what interested me. This is another crack at the rock formations across the dry inlet in the morning. A lot of interesting shapes to play with. Another late summer painting trip comes to an end. When we hiked out, clouds were building up again, and by the time we reached the trailhead, snow was blowing down out of the sky in direct sunshine. Meanwhile, I have an upcoming show in October at the Studio Gallery in San Francisco, and will be cranking away the next few weeks. Plenty of work that has been posted on my blog this past year will be in the show, along with some new studio pieces, as well as a few 'surprises'. Stay tuned! 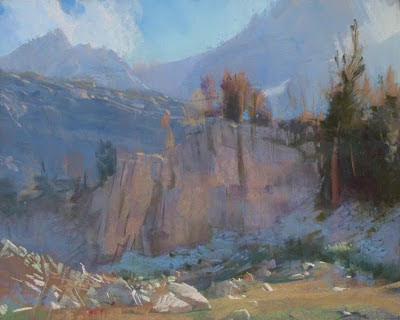 I was able to take a group of lighting TD's from work outside to paint last week, and we were graced with pretty good weather. 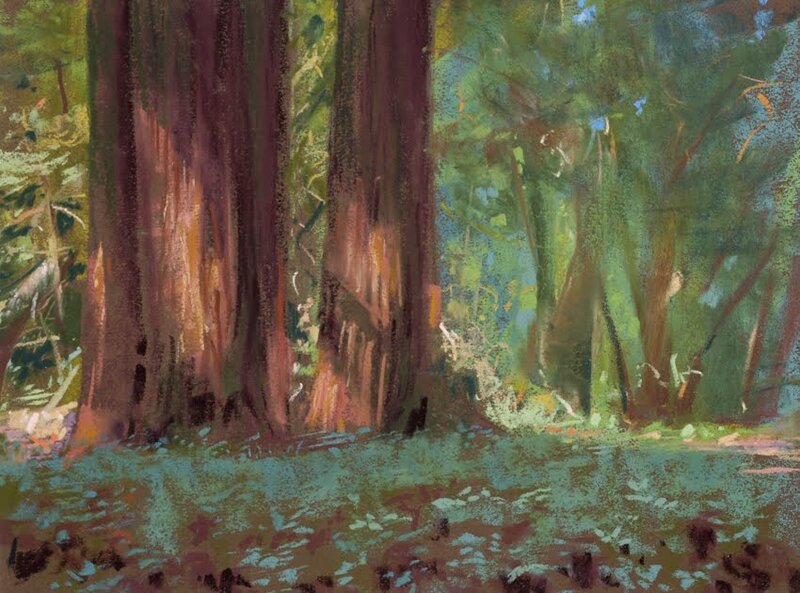 We painted from ridgelines, went to a small lake, and spent a few afternoons in a small Redwood forest. Here are some of the demos I did during the week. As I'll be teaching a workshop in the Sierra Buttes in a few weeks, I wanted to do a post talking about my setup, present and past, to take any mystery out of it, as well as help inform those that are contemplating the purchase of an umbrella, a pastel box, backpack, etc. The photos above shows the way I'm currently working. I'm using an allinone easel, mounted on an old Manfrotto tripod. I can adjust it to comfortably work sitting or standing. This is a 10 x 14 pochade box, which has a hinged foam core panel to mount your paper on. 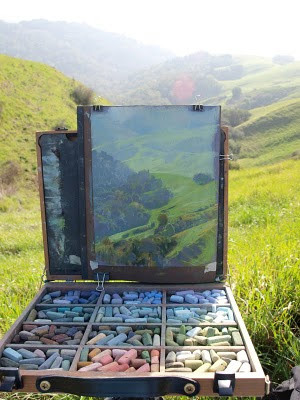 There is storage behind the easel, which is held by velcro. I made a simple storage pad out of glassine, canson, and cardboard, to hold blank paper, as well as finished art, which fits in that space. I can also use the pad to mount paper on for a vertical composition, as shown in the top image. As far as umbrellas go, I've used a variety of them over the years, losing several every year to unexpected gusts of wind. I am currently using the bestbrella, which has worked well for me for the last 7 months. One improvement over other umbrellas is that it is silver on the outside, and opaque black on the inside, reflecting heat, and eliminating diffuse glare. A white umbrella can over illuminate your work under certain circumstances. The mount is extremely sturdy and adjustable. 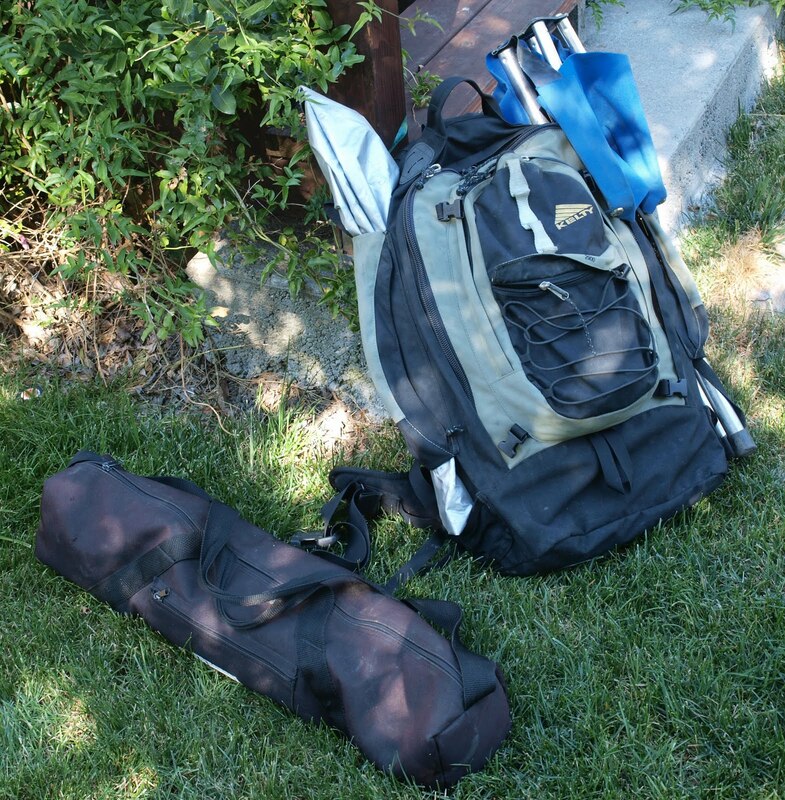 Everything fits into the backpack below, plus a bag for the tripod, and the umbrella mount. If I want to, I can secure the tripod bag to the backpack to keep my hands free. To choose a backpack, I simply went to a sporting goods store with all my art supplies, and started trying to fit everything into the packs they had on display. 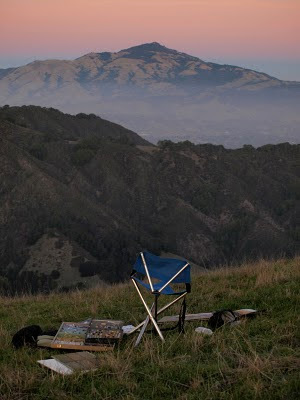 The folding camp stool is from there as well. Other items I carry are a camera, usually looped through my belt, water, sketchbook, and and wipes for my hands. It's ok to have extra room for snacks, extra clothes (windbreaker, hat). 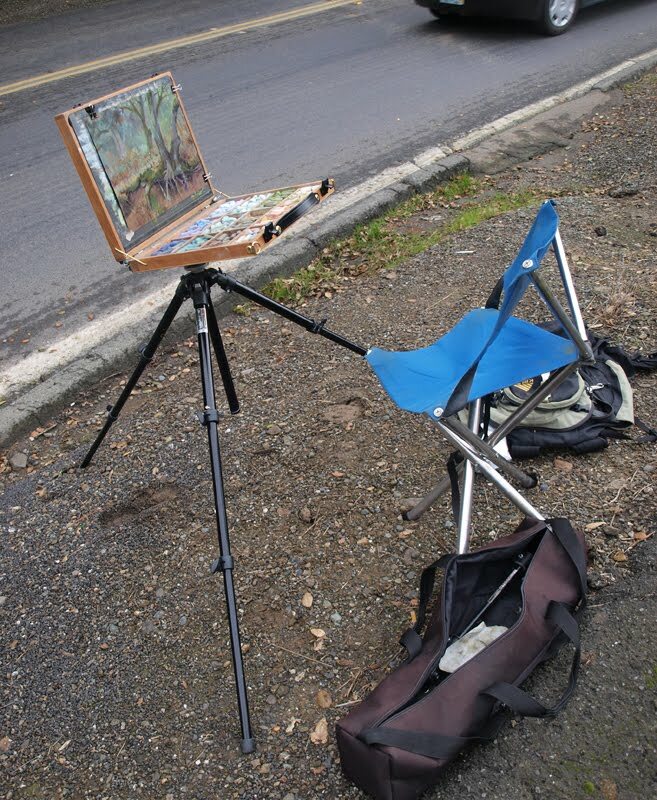 Here's a typical setup by the side of the road. No umbrella needed, as it was an overcast day. The above image shows the way I worked for about 10 years. Same stool, backpack, and tripod as I currently use, but a large, wooden pastel box from Dakota Art Supplies. Also shown is one of the many umbrellas that took a beating over the years. 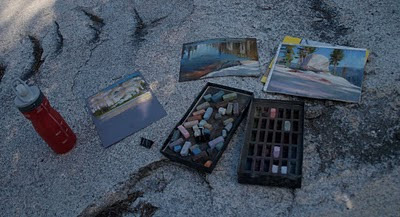 Below is me finishing one last piece before hiking out on the last day of a packtrip in the Sierra. Note the white umbrella. The dark one's provide a more balanced shade than the white umbrellas, imho. 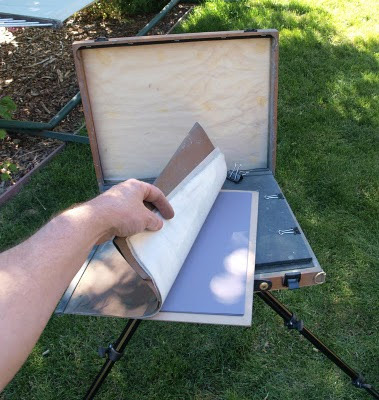 Here's an 'ultralite plein air' setup: One small box of pastels, many of them cut in half to accommodate more colors, a tracing pad cut down for storage, with a same size sheet of foam core to clip paper to. The whole thing fits in a zip-lock bag. 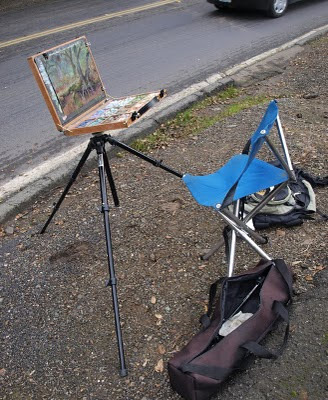 Just sit on the ground and start painting. I took this setup backpacking last year, and had a similar setup for a raft trip down the Grand Canyon a few years ago. The truth is the gear is of less important than the experience. At the same time, you want equipment that will be comfortable, reliable, and easy to use. 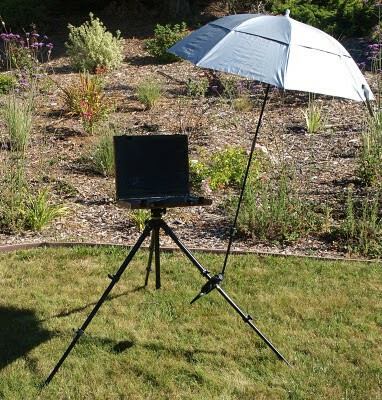 Being able to stand, or sit, as well as control your shade, are very useful 'tools' for working outdoors. You have more options about where to paint that way. Lastly, consider the weight of everything. An 'ideal' setup is the one you're willing to carry with you for a couple of miles. I spent last week painting up in Sonoma County for the Sonoma Plein Air event, which I have been fortunate to attend for the past 8 years. It is a wonderful event for the artists, and hopefully for the residents and patrons who so generously put up the artists in their homes and guesthouses, while we roam about the valley and paint. The weather was less than ideal for the 5 days we were allotted to paint, with rain, drizzle, wind, overcast skies, being predominant. Thursday was the lone exception to that. You should also take a look at the blogs of Terry Miura and Robin Purcell for their perspectives on the week. You might also check out the work of Paul Kratter on his website and you'll be able to see some of his work for the week. Here's a few of the pieces I did with some notes. The sun often rose into a diffuse cloud cover, which softened and attenuated the light considerably in brightness. I abandoned another painting to start this one, when I realized I wasn't going to get the lighting I was expecting. 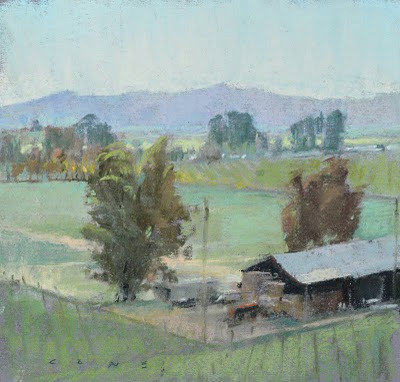 Scenes of this sort are common to the lower end of the valley, as the land is sectioned into vineyards and small dairies, bordered by roads and windbreaks of Eucalyptus trees. The weather during this week was rather dynamic, so whatever lighting situation one might begin a piece with was unlikely to be there midway through it. A lot of my work was done in the rain, or a combination of direct light and overcast, which lent my work a patchy quality, as well as a rather grey nature, as is represented in this image. 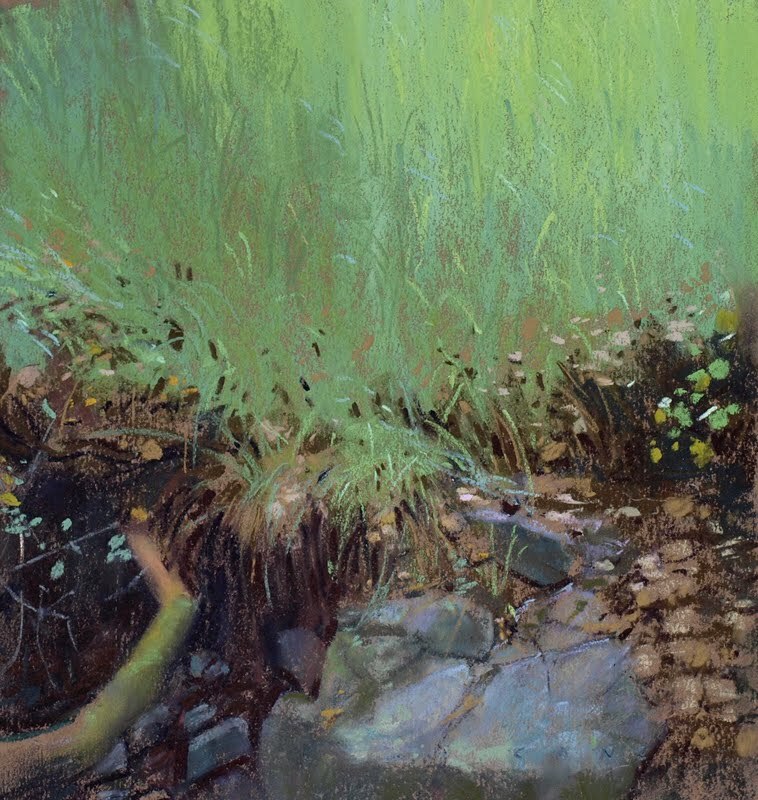 The most interesting thing about this piece for me was the visit of a very large king snake, which came slithering towards me, flicking it's tongue, and eventually disappearing under the mat of dead grass a yard from my feet into a hole, perhaps in search of a meal. 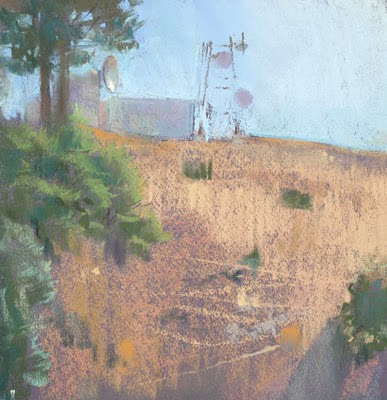 This was painted up at Sugarloaf State Park, a few miles north of Glen Ellen. I have visited it the last few years when I come up to paint, as it is often sunny when the valley a thousand feet below is shrouded in morning fog. Adobe Creek runs through the park, carving a small channel, and exposing a range of boulders and smaller rocks. There are other types of views as well, but I have a fondness for boulders, water, and foliage patterns, which this view had in abundance. 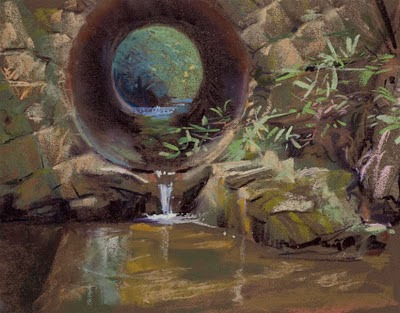 I had spied a small waterfall when driving up to the park, and went back in the afternoon to paint it. Also painted at Sugarloaf Park, trying to leverage my success of the previous day. Instead, the light was gray, and I went looking for qualities that compelled me to paint. This is a fragment of a landscape... really only a few square feet in area, but I liked the contrast in the shadows below the beautiful hues of the mossy root, the gradient of greens on the grass, as it curved upwards from the gully to face the sky, as well as the tones on the rock. Even the dead oak leaves started to interest me with the way they broadcast their orientation to the sky through a compressed range of value and temperature shifts. In such a small portion of nature, all sorts of subtle (and not so subtle) cues were operating about light and form, the only exception being atmosphere. But why would it be any other way? The 'rules' apply regardless of scale... there's the lesson! 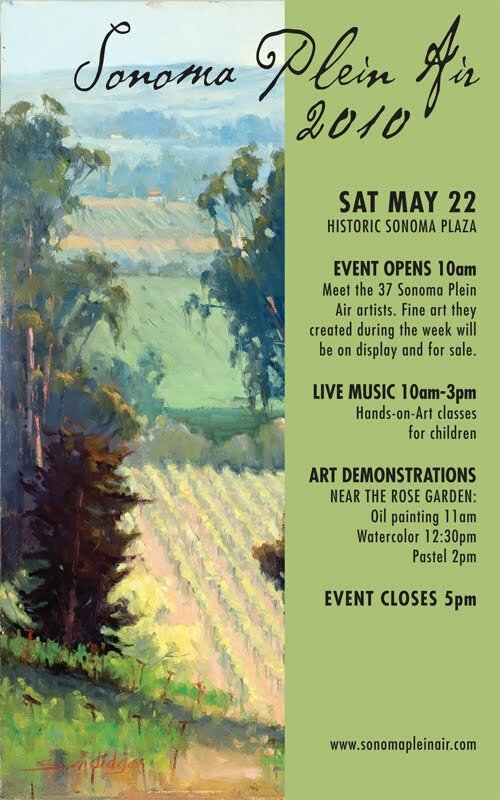 I'll be headed later today to Sonoma county for the annual Sonoma Plein Air festival, and will be exhibiting a week's worth of work in the county next Saturday, May 22, in Sonoma Plaza, along with many other fellow artists such as Terry Miura, Paul Kratter, Randy Sexton, Carol Hesse-Low, and Tim Horn. Below are a few pieces from the last month or so from over my back fence, and one from the shadowed recesses of Pinehurst Rd., which is awash in forget-me-nots for a brief period of time. Hope to see some of you in the plaza next Saturday. Hope we get some good weather, or mist and local color will be prevalent.